Arriving the day after the second iOS 12 public beta, Apple made the second macOS 10.14 Mojave public beta available to download for testing on Friday, with beta participants able to update the first beta installed on their Mac to the new release. The second MacOS 10.14 Mojave public beta surfaces ten days after the first was offered for download, and in the same week as the third developer beta. The contents of the second public beta is expected to be identical in content to Tuesday's third developer beta. Participants in the beta program can download macOS Mojave initially from the Apple Beta Software Program website, along with public betas of iOS and tvOS, after registering. Existing installations can be updated from within the first beta, by entering System Preferences and using the Software Update option, instead of downloading the operating system again. 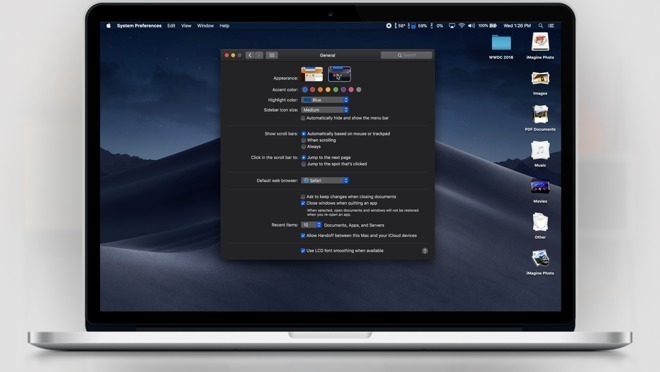 MacOS Mojave's features list includes a number of productivity-focused improvements starting with Stacks for automatic grouping and sorting of files on the desktop. The Finder has a new Gallery view showing media and metadata, with contextual quick actions also triggerable. Markup can now be invoked within Quick Look without leaving the menu, with the feature also allowing for videos to be trimmed without using an editing tool. The screenshot interface makes it easier to take images of the desktop, as well as to record video, with a reduced workload on the processor compared to earlier methods. Continuity Camera can be used to take a photograph using an iPhone or iPad and insert it into a Mac app, without manually transferring the file between the devices. Push to enable iOS apps in macOS has led to Apple converting some of its own apps to the platform, including News, Stocks, Voice Memos, and the Home app for managing HomeKit devices. The Mac App Store has been updated with a new interface that borrows elements from the iOS App Store. Other notable macOS additions include Create ML and Core ML2, and a new Dark Mode. Both Apple and AppleInsider strongly advise against installing beta releases onto mission-critical hardware, due to the possibility of a loss of data. It is suggested those wanting to try the beta to do so using secondary devices, and to retain backups of any important data before installation.